Group-based exercise is a popular method of improving fitness. However, limited research exists on the multidisciplinary responses to group-based exercise. The aim of this study was to compare the physiological and mechanical demands of aerobics, indoor group cycling, and netball. Fourteen recreationally active females (age 20 ± 2 years, body height 1.65 ± 0.09 m, body mass 65.9 ± 11.8 kg, body fat 26.3 ± 7.2%) participated in three experimental trials (aerobics, indoor cycling, netball) in a randomised order with 1 week intervening. Heart rate, blood lactate, RPE and PlayerLoad™ were measured. A repeated-measures ANOVA revealed mean and peak heart rate (beats·min−1) were lower (P < 0.05) for aerobics (130 ± 114; 176 ± 18) than indoor cycling (150 ± 9; 191 ± 9) and netball (144 ± 11; 195 ± 6), respectively. Blood lactate (mmol·L−1) was higher (P < 0.001) after indoor cycling (5.6 ± 2.6) compared to aerobics (2.2 ± 1.4) and netball (2.5 ± 1.1). RPE was not different between trials. PlayerLoad™ (a.u) during indoor cycling (213.9 ± 46.9) was lower (P < 0.05) than netball (358.5 ± 94.5) and aerobics (296.9 ± 99.0). These results suggest indoor cycling stimulates greater physiological demands, whilst netball and aerobics elicit a higher PlayerLoad™ corresponding to higher mechanical demands. These findings may have implications for exercise prescription in recreationally active females. The association between physical activity and health is well established, yet only approximately half of the UK adult population engage in regular moderate or higher intensity physical activity  and physical inactivity is a global pandemic . Aerobics and other group exercise classes have become an increasingly popular mode of exercise due to the fact that individuals can exercise whilst socialising and having fun . It has been reported that aerobics exercise classes are a form of high-impact, but lower intensity, exercise with typical heart rates equating to 68–79% of maximum [4, 5]. Aerobics classes combine rhythmic aerobic exercise and strength training with the objective of improving cardiovascular fitness including reduced resting heart rate and blood pressure , improved maximal oxygen uptake and muscle strength, and reduced body fat . Furthermore, the maintenance and/or increase of skeletal health from the mechanical demands associated with aerobic exercise classes are viewed as a key benefit, particularly in female populations . Indoor cycling is one of the most popular forms of group-based exercise comprising cardiovascular exercise with phases of high-intensity intervals utilising large muscle groups [9, 10]. Participants typically attain heart rates equating to ~ 80% of maximum and, consequently, the energy expenditure during a class is high [10, 11, 12]. Thus, indoor cycling may provide a training threshold at which several physiological benefits can occur, including cardiovascular (improved heart function, increased maximal oxygen uptake) and skeletal muscle (increased muscle mass) adaptations together with reductions in body fat [9, 10]. However, due to the non-weight bearing nature of the class, it is postulated that these health benefits occur with low impact loading. One alternative to class based exercise is traditional sporting activity. Netball is predominantly a female sport played by more than 20 million people in over 80 countries . In recent years, netball participation at a recreational level has become increasingly popular, due to the group and social exposure provided via the team environment. As such, females may choose to participate in this sporting activity as part of a health and fitness programme. Intermittent activities such as netball comprise frequent changes in activity with these occurring, on average, every 4–6 s . These intermittent and multi-directional movements often elicit a higher physiological response, e.g., elevated heart rate and blood lactate, than continuous style activities . Furthermore, the changes in direction are likely to stimulate a greater PlayerLoad™ and in particular an increased medial–lateral loading compared to linear activities . Despite the reported benefits of physical activity , and the use of group-based exercise to increase exercise adherence , there is a need for research on the physical demands of different modes of group-based exercise in recreationally active females. This information may facilitate the prescription of future exercise interventions. Thus, the aim of the current study was to assess the physiological demands, quantified by heart rate, blood lactate and RPE and also assess the mechanical demands, quantified by PlayerLoad™, of aerobics, group indoor cycling and netball sessions in recreationally active females. It was hypothesised that indoor cycling would elicit higher physiological responses and a lower PlayerLoad™ than aerobics and netball. Fourteen recreationally active females (age 20 ± 2 years, body height 1.65 ± 0.09 m, body mass 65.9 ± 11.8 kg, body fat 26.3 ± 7.3%) volunteered to participate in the current study. All participants were injury-free for a minimum of 6 months prior to testing, were non-smokers and had a minimum of 3 years’ experience of completing group-based exercise classes and netball. Participants were normotensive (systolic blood pressure ≤ 140 mmHg and diastolic blood pressure ≤ 90 mmHg). The study was approved by the Departmental Research Ethics Committee and conformed to the declaration of Helsinki. Participants received written and oral instructions before the study. Written informed consent was provided by all participants. A repeated-measures design was utilised in which all participants completed a body composition assessment, a familiarisation and then three experimental trials, in a randomised order, with 1 week intervening each. The three experimental trials were aerobics, indoor cycling and netball sessions lasting the duration of 1 h to reflect a standard class design. Each trial was conducted at the same time of day to avoid any variations due to circadian rhythms . All participants refrained from caffeine or food consumption in the hour preceding trials. Furthermore, both alcohol consumption and exhaustive exercise were avoided in the 48 h prior to the trials. All participants underwent comprehensive health screening prior to participation. This involved the completion of a medical questionnaire and screening form. Blood pressure and heart rate were measured using an automated blood pressure and heart rate monitor (Omron, Mx3 Plus, The Netherlands). Body height was measured using a stadiometer (Holtain, UK) and body mass measured using calibrated top-pan scales (Seca, Germany). Body composition was assessed using air displacement plethysmography (BodPod Body Composition system, V4.2, Life measurement Instruments, USA). This allowed the measurement of the relative proportions of fat and lean mass in the body. Participants wore minimal tight-fitting clothing and a swim cap, and were required to sit quietly and still in the enclosed pod during measurements. The BodPod is deemed a reliable and valid method for body composition assessment . The aerobics trial was completed in a dance studio and led by a qualified fitness instructor. The aerobic session comprised a warm up, main phase, and cool down with dance and body-conditioning moves set to music. During the main phase, the basic aerobic moves were taught and progressed in intensity, to raise heart rate. The session involved a mix of classic aerobics fast and upbeat exercises, including jogging forward and back, grapevines, leg curls, knee lifts, box steps, travelling kicks, lunges, side, and back lunges. Indoor cycling was completed in the dance studio, performed on a stationary cycle ergometer (Keiser M3 indoor bike, Keiser UK Ltd, UK) and was led by a qualified fitness instructor. The session comprised a warm up, main phase, and cool down. The class comprised combinations of seated sprints and climbs, standing runs and climbs, and jumps. The combinations were randomised with varying durations ranging from 30 s sprints to 4 min climbs, with active recovery between. The netball trial was completed in a sports hall and was delivered by a qualified coach. The netball game replicated a real netball match and involved two matched teams of seven players. The standard rules of a netball game were applied, with participants on each team attempting to score as many goals as possible whilst, at the same time, preventing the opposition from scoring. The game was split into 15 min quarters with a 3-min break between the first and second and the third and fourth quarters, respectively. Half-time between the second and third quarters lasted 5 min. Heart rate was continuously measured using short-range radio telemetry (Polar T31, Polar Electro Oy, Finland) throughout the trials and mean and peak heart rate recorded for each trial. Capillary blood samples were extracted from participant’s fingertips prior to experimental trials and immediately after all trials. The capillary blood sample was immediately analysed for lactate concentration using a portable lactate analyser (Lactate Pro, LT-1710, Japan). Rating of perceived exertion was assessed immediately post each experimental trial using the Borg 6–20 RPE Scale . Participants wore a Global Positioning System (GPS) (MinimaxX S4, Catapult Innovations, Scoresby, Australia) mounted tri-axial accelerometer (Kionix KX94, Kionix, Ithaca, New York, USA), which recorded at 100 Hz to determine tri-axial PlayerLoad™ throughout the experimental trials. The GPS device was positioned at the cervical region of the spine and held in a neoprene vest (Catapult Innovations, Scoresby, Australia). Accelerometry data were recorded for the duration of each experimental trial, and was analysed post-testing using the Catapult Sprint software (Version 5.0.9.2; Firmware 6.75). Planar PlayerLoad™ in the anterior–posterior (PLAP), medial–lateral (PLML), and vertical (PLV) movement planes were quantified. Total accumulated uniaxial load was calculated using the rate of change in acceleration: √ [(aAP1 − aAP−1)2/100]. This was done for each of the three discrete uniaxial vectors. The cumulative (triaxial) Total PlayerLoad™ was also calculated, defined as the sum of the three uniaxial vectors. All variables are expressed as mean ± standard deviations (SD). Significance level was set at P ≤ 0.05 using IBM SPSS Statistics v 22.0. Data were initially assessed for normality using the Shapiro–Wilk test. A repeated-measures ANOVA was conducted on each physiological variable (blood lactate, heart rate, RPE) and in PlayerLoad™ to determine whether there were any significant differences between the three exercise modes. When a significant main effect was found, a post-hoc pairwise comparison with Bonferonni correction factor was applied. Mean and SD values for each variable during aerobics, indoor cycling and netball are illustrated in Table 1. 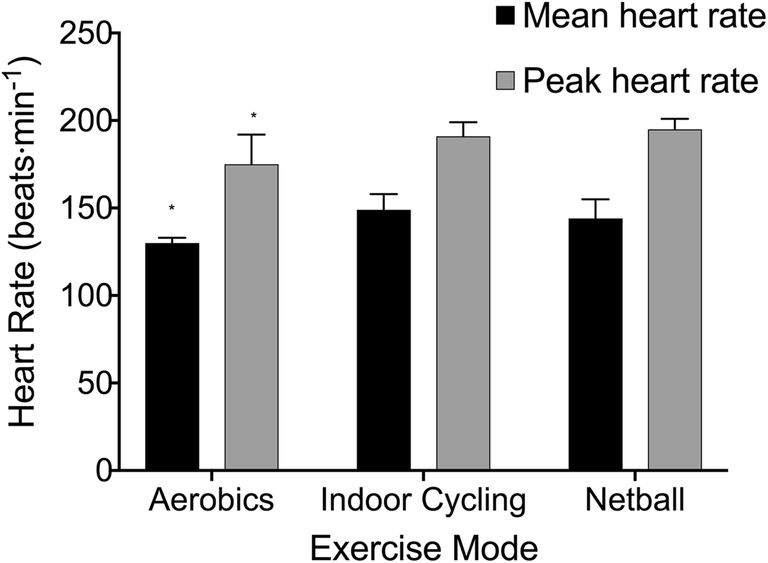 Mean and peak heart rate responses during indoor cycling and netball were significantly higher in comparison to aerobics (P < 0.05), but were not different from each other. These results are illustrated in Fig. 1. Blood lactate was significantly higher (P < 0.001) after indoor cycling compared to aerobics and netball, which were not different to each other. These results are illustrated in Fig. 2. No significant differences (P > 0.05) in RPE across the three trials were observed. PlayerLoad™ during indoor cycling was significantly lower (P < 0.05) than aerobics and netball, which were not different to each other (Fig. 3). 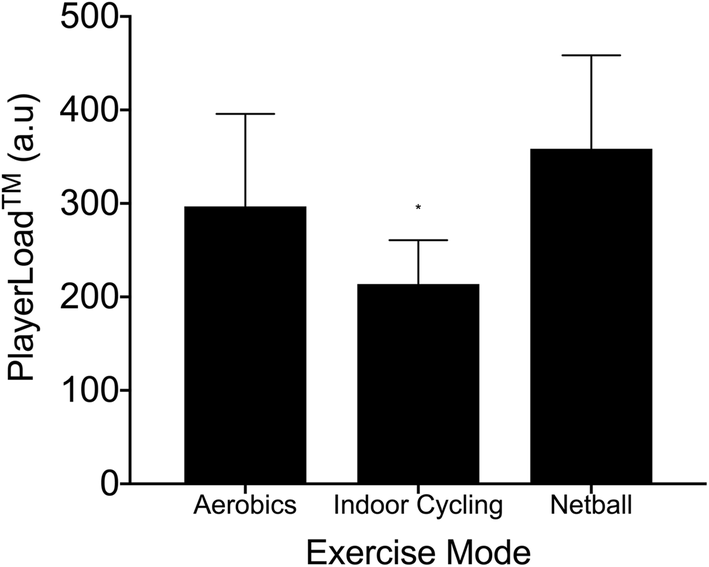 Netball generated greater PLAP in comparison to indoor cycling (P = 0.014). 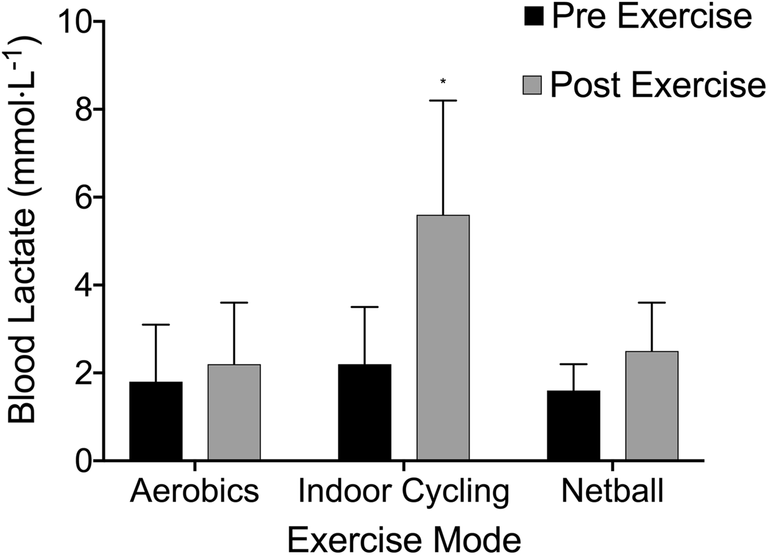 Netball and aerobics generated greater PLML in comparison to indoor cycling (P < 0.05). Again, both netball and aerobics elicited a greater PLV movement in comparison to indoor cycling (P < 0.05). However, no differences between netball and aerobics were observed for PLAP, PLML, and PLV (Fig. 4). The aim of the present study was to compare the physiological and mechanical demands of group-based exercise classes and netball in recreationally active females. The physiological responses, reflected by blood lactate, were highest in indoor cycling. Heart rate responses were greater in both indoor cycling and netball in comparison to aerobics. However, the aerobics and netball session elicited a greater PlayerLoad™. These findings suggest that indoor cycling elicits higher physiological responses with a lower mechanical load in comparison to aerobics and netball. Mean heart rate (HR) values observed from the aerobics class were 130 ± 14 beats·min−1 and peak values attained were 176 ± 18 beats·min−1. The peak heart rates observed in previous research [18, 19] were slightly higher, but within a similar range, with values of 178 ± 7 and 181 ± 7 beats·min−1 reported, respectively. However, Luettgen et al. reported mean HR values of 154 ± 14 beats·min−1 and peak values of 196 ± 7 beats·min−1. The lower values in the current study may be due to the aerobics class involving lower intensity conditioning movements compared to the higher intensity dance activities utilised in the previous research [4, 5]. The phases of body conditioning (strengthening and isometric exercises) that occurred within the class could potentially lower HR values. In contrast, the netball session and indoor cycling class elicited significantly higher HR responses, corresponding to high-intensity exercise based upon the HR values following the ACSM guidelines . 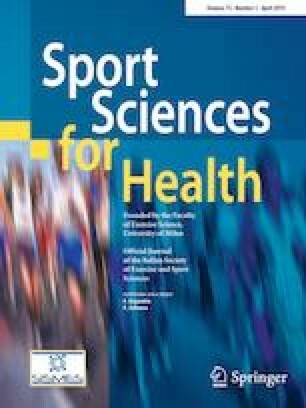 The mean HR of 144 ± 11 beats·min−1 and peak HR of 195 ± 6 beats·min−1 reported during the netball session in the current study support those observed by Chandler et al. during university match play. Similarities in values may be due to the similar fitness levels and experience of the participants; however, many of the previous studies [13, 14, 22] have utilised competitive netball players. Similarly, some studies [11, 23] pertaining to indoor cycling have reported HR as a % of maximum which makes comparisons difficult as maximum heart rate was not established in the current study. In future studies, preliminary testing utilising an incremental maximal test should be utilised to assess maximal heart rate. Peak values in the current study were 191 ± 9 beats·min−1 and the mean HR was 150 ± 9 beats·min−1. Some studies [9, 23] observed considerably lower HR values, reporting mean HR values of 143 ± 25 beats·min−1 and 130 ± 2 beats·min−1, respectively. However, Muyor  reported similar values of 152 ± 14 beats·min−1. The variance of HR responses may be due to self-selected effort  although effort levels were set by the instructor. The instructor may, also, influence HR via the choreography adopted. Although all instructors follow particular phases, the phase order and set intensity can be dependent on the instructor, with research suggesting the variety of intensities and positional movements included within an indoor cycling class influence the physiological demands of the exercise . The indoor cycling class elicited a higher post-exercise blood-lactate value in comparison to the aerobics and netball sessions. Intermittent activities, such as indoor cycling, comprise periods of high-intensity work alternated with low-intensity activity that allows accumulated lactate to be dissipated. Previous studies reported blood-lactate values of 5.3 ± 0.69 mmol·L−1 and 7.2 ± 0.8 mmol·L−1 after an indoor cycling class [23, 24]. Piacentini et al. reported these values in adult males whilst Kang et al. investigated a group of young adults comprising both males and females. If the work:rest ratio is altered during a class, it is possible that lactate production may exceed the rate of removal. Previously, it has been reported [11, 23] that females could sustain high-intensity efforts during indoor cycling which would elicit high concentrations of lactate. However, the lower blood-lactate values observed in aerobics and netball are similar to those found in previous intermittent activities such as rugby union (2.8 mmol·L−1) [25, 26]. Conversely, slightly higher values of 3.7 mmol·L−1 and 4.8 mmol·L−1 have been recorded during aerobics classes [27, 28] using recreationally active females. The variance in blood-lactate concentrations may be due to the timing of the samples. Blood lactate is sensitive to both the time of sampling and the activity profile immediately preceding measurement, and thus it is often difficult to make direct comparisons between studies. Blood-lactate levels typically continue to increase for several minutes after cessation of exercise, due to the continuous efflux from previously active muscle and then the blood-lactate concentration declines back to baseline values . Blood lactate was measured immediately post exercise, but values could have differed if they were taken earlier in the session or after a longer recovery period post exercise. Future studies should consider the measurement of blood lactate at more frequent time points during and post exercise. RPE did not significantly differ across the three exercise modes and values are similar to those previously reported in the literature [18, 21, 23]. Many exercise classes utilise RPE as a method for participants to monitor their own exercise intensity. However, it has been suggested  that RPE is an insensitive measure of activity demands when compared with accelerometer data, or that all training activities elicited similar perceptions of effort, despite the differences in physical load. Kang et al. proposed that as long as the average intensity remains similar, the overall perception of exertion would stay unchanged. The fact that the average RPE for spinning and netball did not differ may provide additional support for the use of such high-intensity exercise, as the increase in energy expenditure was not necessarily associated with an increased perception of exertion . Indoor cycling generated significantly lower PlayerLoad™ values in comparison to aerobics and netball. Indoor cycling is a non-weight bearing exercise, it therefore lacks osteroarticular impact compared with aerobics exercise classes  which contributes to lower accumulation of PlayerLoad™. Consequently, it can be postulated that indoor cycling classes may improve cardiovascular outcomes (as indicated by the physiological responses) whilst reducing mechanical loading. Even though the cycling class represents a static challenge in comparison to aerobics and netball, the contributions of core strength  to maintain upper body balance  during the varied intensities and technical elements highlights why the relative contributions to loading were similar between tasks. Aerobics and netball are both multi-directional activities, with movement in the anterior–posterior and medial–lateral plane in addition to the obvious vertical loading . Therefore, it is not surprising that there were no significant differences in PlayerLoad™ and associated planar loads generated between these two modes of exercise. The greater vertical, medial–lateral and anterior–posterior movement loads generated by aerobics and netball in comparison to indoor cycling, do not only come from the impact of vertical loading, but the accelerations and decelerations and the rapid changes in movement [22, 32]. The effects of physical activity on bone mineral density (BMD) are primarily linked to the mechanisms of mechanical loading for maintenance and increase of bone health that are particularly important in females [33, 34]. Therefore, as netball and aerobics elicit greater impact, multi-directional, acceleration and deceleration phases, it could be argued these movement patterns may offer a positive outcome for females for bone health. Further research is required to establish the impact of this type of exercise on bone mineral density. Conversely, for exercisers requiring minimal impact loading, exercise such as indoor cycling may be preferable over the modes of aerobics and netball based on PlayerLoad™ values. To conclude, the results of the current study support the original experimental hypothesis that indoor cycling would elicit higher physiological responses and a lower PlayerLoad™ than aerobics and netball. Indoor cycling is deemed a high-intensity activity with greater physiological demands in comparison to aerobics and netball. The elevated heart rate and blood-lactate values are indicative of a greater cardiovascular challenge suggesting that, whilst beneficial, the elevated anaerobic contribution may not be suitable for beginners and individuals with health conditions. It is consequently proposed that heart rate be monitored during classes to adjust intensity accordingly. The findings also suggest aerobics exercise and netball elicit a greater mechanical stimulus, which is essential for bone health but may also increase the risk of injury. These findings have practical applications in terms of facilitating appropriate exercise prescription for recreationally active females.